Photo by Fritz Rethage © August 2003 All rights reserved. There are several tide gates along Berry's Creek. The highest concentration of mercury in freshwater sediments in the world in in Berry's Creek. It is a superfund clean-up site. More about Riser Ditch to include illustrations and photos. More about Berry's Creek with map. As rivers go, the Hackensack is certainly one of the worlds smallest (only 32 miles long) and one of its most urban (nearly 20 million people live within a short drive or train ride from its banks). In 1921, construction of the Oradell Dam was begun and completed two years later, creating the Oradell Reservoir. In 1989, United Water dedicated a new, state-of-the art water treatment facility to counteract the polluted runoff entering the reservoirs. Eventually, three more reservoirs were dug to satisfy the ever-increasing need. Harnessing the Hackensacks upper watershed did something else in addition to providing drinking water: it effectively created two rivers, a freshwater ecosystem above the Oradell Dam and a brackish water estuary below it. The lower reaches of the river suffered tremendous degradation during the Industrial Revolution of the 19th and early 20th centuries. From the city of Hackensack south to Newark Bay, factories spewed untold gallons of untreated waste into the river. Raw sewage and refuse of all kinds were dumped in and near the river. This toxic legacy has left hotspots of chromium, PCBs, mercury and other contaminants throughout the rivers ecosystem. The most dramatic feature of the Hackensacks lower watershed is, without question, the New Jersey Meadowlands. At one time stretching over 32 square miles and encompassing nearly 25,000 acres of wetlands and waterways, the Meadowlands has been reduced to only a third of its former size. 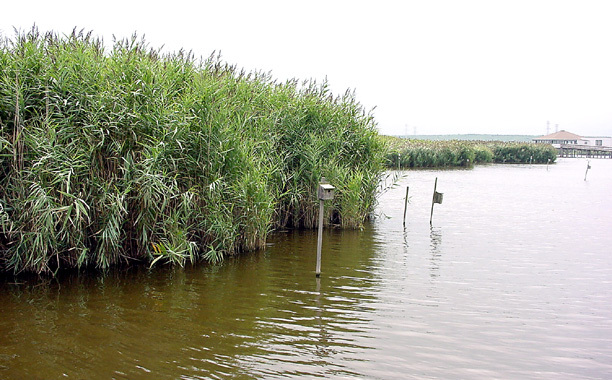 By the late 1980s and early 1990s, the conservation community in New Jersey had begun to take notice of issues involving the Hackensack River  both in the Meadowlands and in the upper watershed. 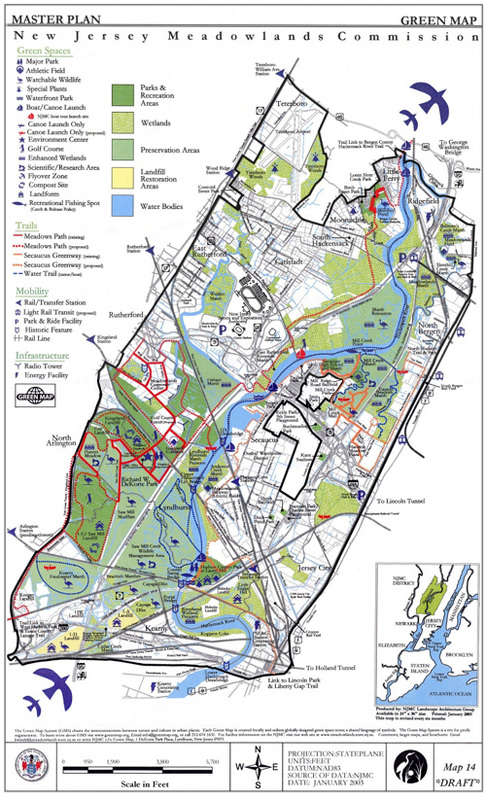 Fifty-three years ago, Leonia, Palisades Park, Ridgefield Park, and Teaneck each donated hundreds of acres of municipal land to Bergen County for the development of an Overpeck County Park. The County built recreational facilities in the Leonia section of the park north of Fort Lee Road and in Palisades Park. The section of the park in Leonia south of Fort Lee Road was left undeveloped. All of the Ridgefield Park and Teaneck sections of the park were left undeveloped and were used as dumping sites by the County and became environmental hazards. Three years ago, the County proposed building a Minor League Ballpark in the 100-plus acres of the undeveloped Leonia/Palisades Park section. Ridgefield Park and Teaneck pressed an ongoing lawsuit with the County because their sections of the park were never developed. A judge ruled that the County must proceed with the remediation and development of Overpeck Park according to a specific timetable. The first steps must be accomplished by September 2003 and the project completed by September 2009. If the timetable is not met, the County will be fined approximately $2.5 million a year. The County developed a comprehensive, environmentally safe Plan for Overpeck Park and set forth as a Request for Proposals (RFP), a request for bids. Only one contractor submitted a bid, Tully Environmental, Inc. Tully is a firm specializing in brownfield reclamation. Tully removes landfill, cleanses it, and uses it to create parks and similar projects. It makes its money from the owners of the landfill. The restoration of Fresh Kills, a garbage dump in Staten Island, is a Tully project. Tully would charge Bergen County nothing for remediating and developing Overpeck Park, no bonding, no additional taxes, for a project worth $89 million. This initiative is in litigation. The NJSEA was established On May 10, 1971 with the mission of constructing and managing a new state-of-the-art sports complex for the New York Giants football team and launch New Jersey into the sports and entertainment big leagues. A 750-acre site in East Rutherford was chosen as the location for a world-class racetrack and football stadium to be funded through revenue bonds backed by proceeds created by the racetrack itself. The Meadowlands Racetrack debut on September 1, 1976, to a capacity crowd of 40,000 racing fans. A few months later Giants Stadium opened to a sold-out crowd of 76,042 NFL football fans who watched the Giants play the Cowboys in New Jersey's professional NFL debut. The NJSEA added an arena, now Continental Airlines Arena, to the Meadowlands Complex in 1981. The arena opened to six sold-out performances by New Jersey's own Bruce Springsteen. Later the arena became the home of the New Jersey Devils, Nets, Seton Hall Pirates and the New Jersey Gladiators. The Meadowlands now hosts over 600 events annually and generates $62 million in direct and indirect sales, income and property taxes. Additionally, the Meadowlands contributes $1.2 billion into New Jersey's economy and directly supports 7,590 full-time jobs. It has been proposed moving the sports teams to Newark and redeveloping Contintental Airlines Arena. Six proposals were presented with Mill Corp./Xanadu taking lead. 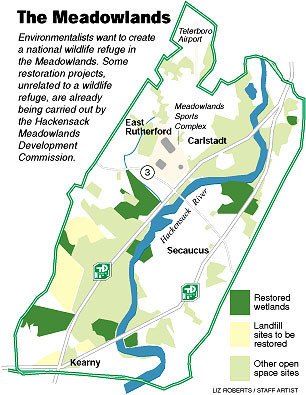 Hartz, a long time Meadowlands developer also made a proposal, is contesting the award. Xanadu is a multi-use family entertainment, office, and hotel uses. Xanadu proposes indoor skiing, indoor surfing, and extreme skate park, Bergen Cliff Hawks minor league ballpark, a creative arts studio for kids, an experimental learning play city for kids, a luxury spa, fine dining, and night life at Xanadu capitalize on existing sports complex uses and introduce new, related and complementary uses to the site. This web-site was re-launched August 2004 and provides more details. The deal is Mills Corp. to give 600 acre Empire Tract for state preservation; $65 million pledge towards roadway & infrastructure improvements; Promise of $860 million in revenues during first 10 years of operation; and flexibility of leaving Continental Arena intact if necessary. State level officials have registered concern over the lack of any mass transit plans, or funds to pay for any mass transit, although Secacus Transfer Station is nearby. Local officials have protested that they do not have any input in the decisions being made. The Official ground breaking is scheduled for Septermber 3004. 600 acres that could be traded for the Meadowlands Environmental Park, if Mills gets the Continental Arena Redevelopment contract. If not, Mills has expressed plans for building a mega shopping mall on the site. A century ago the Meadowlands was a vast piece of open space spanning 21,000 acres. Today, on land outside of the Arena/Giants Stadium property, only 8,400 of those acres remain undeveloped, keeping river water from flooding the streets of surrounding communities. That part of the Meadowlands still supports a diverse and growing concentration of migratory birds and is home to 65 species of nesting birds, and more than 50 species of fish and shellfish. We can save this last, largest contiguous parcels of open space and wetlands left in Northeastern New Jersey, clean it up from a swampy wasteland and garbage dump site, and turn it back into a magnificent natural, nationally and even internationally renowned environmental park. Establishing the Meadowlands Environmental Park will provide this and future generations with unparalleled opportunities for eco-canoe trips, nature walks, bird watching, other appropriate recreational activities, and an environmental educational center for our children. HMDC on-line [Index] Maps, reports, images, links, etc. [Interactive maps] -- Zoning, parcel, land use, aerial photos, elevation, etc.